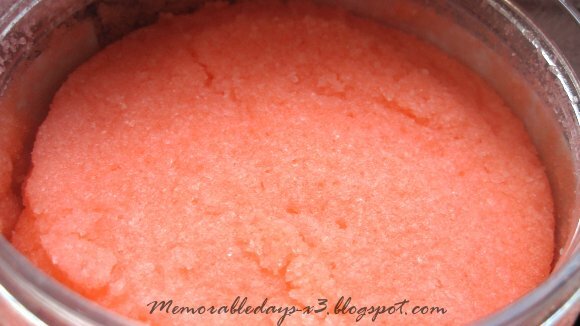 Natures - Grapefruit sea salt scrub review | Memorable Days : Beauty Blog - Korean Beauty, European, American Product Reviews. This is the scrub that I was writing about in my previous post about Keratosis Pilaris (KP): http://memorabledays-x3.blogspot.com/2010/12/do-you-have-small-red-bumps-on-your.html. I have been using this product for a year now and this made my arms a lot smoother than before =) It's a grapefruit sea salt scrub. There is also a lavender sea salt scrub available of the same brand, but I don't like the scent of lavender so I didn't buy that one. Loving the scent ^_^ it really smells like grapefruit, but the scent isn't overwhelming. The texture is just like salt, its very rough, so don't it rub too hard otherwise your arm will be extremely red o_o". It's a body scrub so DON'T use this scrub on your face, since it's too rough for your face. It would be better if it was less rough though. Do you use a body scrub? Have you used a sea salt scrub before? Klinkt heel fijn, misschien ga ik die wel kopen! Als je Keratosis Pilaris hebt, zal ik het zeker uitproberen^^! wow great review. beautiufl pictures! i've never used sea salt before but i'll keep an eye out for this product! 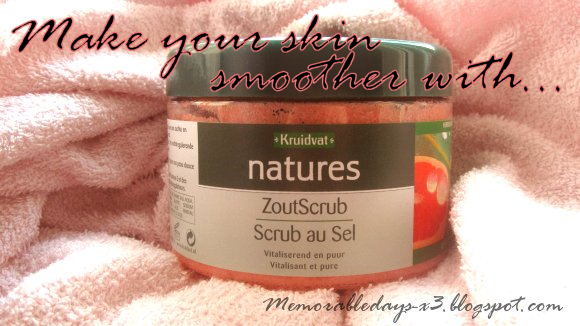 wow I want the scrub!the color and texture seem so good =) thanks for sharing! the color seem so good !